Ubungen began to compose interdisciplinary work, crossing the boundaries of academia and art making, upon leaving graduate school in history after completing her first year. Desirous to continue research and investigation in theater/performance as well as in a range of academic fields (social history, ethnic studies, race relations, critical theory) Ms. ubungen resisted the isolated specialization of both fields and envisioned work that expanded to include communities in a more socially relevant way. Utilizing historical sources and research methodologies in the context of developing new work, Ms. ubungen disrupted conventional notions of constructing historical narrative while embracing content to inform the creative process. Her large-scale dance theater works incorporated the focused rigor of intellectual inquiry allowing for the constraints of academic study to inform the shaping of work. In tandem, ubungen utilized embodied research, structured improvisation and a dialogic process to create a spacious performance environment where content was allowed to breathe. In this way, the historical content became a visually memorable and viscerally powerful live experience. With her former company Pearl Ubungen Dancers and Musicians (PUD&M) Ms. ubungen created a body of work drawn from the history of relations between the Philippines and the United States. These epic works highlighted the obscuration of history/memory through powerful dance theater – amongst them Pinay (1992) Bamboo Women (1994) Tagulaylay: A Requiem for Lives Lost during the Philippine American War (1999-2000) and the Makibaka! CD-Rom and Performance Project (2001-2002). Ms. ubungen continues to produce work informed by multiple, disparate fields often extending the research and development phase of the work over a period of years. (PAM Original Prints B9 F8),”Have you a pass? 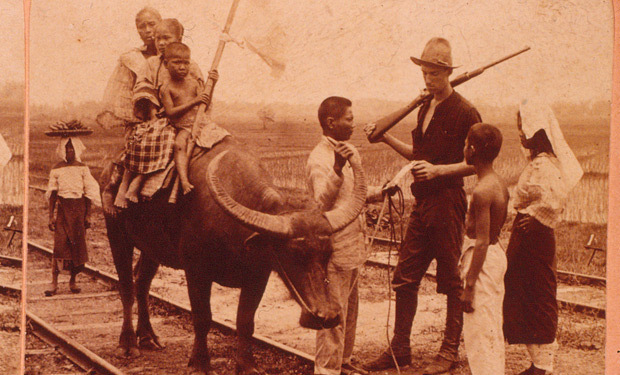 Scene on the firing line, Philippine Islands.” circa 1899.